The Department of English & Modern Languages of North South University presented survey findings of self-assessment through a workshop held on Tuesday, March 13, 2018 at the Conference Room. 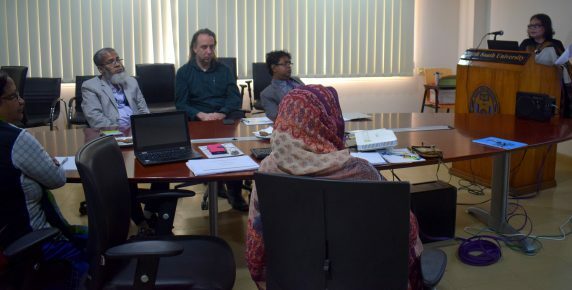 In the workshop, Dr. Shireen Huq, Professor of the Department and SAC Head discussed the most important survey findings of self-assessment with the faculty members, IQAC members and other stakeholders. Dr. Abdur Rob Khan, Dean, School of Humanities and Social Sciences was also present among others in the workshop.